A Taste of Honey is the first play by the British dramatist Shelagh Delaney, written when she was 19. It was initially intended as a novel, but she turned it into a play because she hoped to revitalise British theatre and to address social issues that she felt were not being presented. 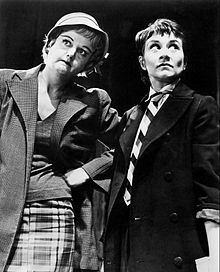 The play was first produced by Joan Littlewood's Theatre Workshop and was premiered at the Theatre Royal Stratford East, a small fringe theatre in London, on 27 May 1958. The production then transferred to the larger Wyndham's Theatre in the West End on 10 February 1959. The play was adapted into a film of the same title in 1961. A Taste of Honey is set in Salford in North West England in the 1950s. It tells the story of Jo, a seventeen-year-old working class girl, and her mother, Helen, who is presented as crude and sexually indiscriminate. Helen leaves Jo alone in their new flat after she begins a relationship with Peter, a rich lover who is younger than she. At the same time Jo begins a romantic relationship with Jimmy, a black sailor. He proposes marriage but then goes to sea, leaving Jo pregnant and alone. She finds lodgings with a homosexual acquaintance, Geoffrey, who assumes the role of surrogate father. Helen returns after leaving her lover and the future of Jo's new home is put into question. A Taste of Honey comments on, and puts into question, class, race, gender and sexual orientation in mid-twentieth-century Britain. It became known as a "kitchen sink" play, part of a genre revolutionising British theatre at the time. By way of a visual backdrop to A Taste of Honey, Delaney reflected on life in Salford in a documentary, directed by Ken Russell, for BBC television's Monitor that was broadcast on 26 September 1960. In the first scene, Helen and her teenage daughter; Jo, are moving into a shabby flat. Within a few minutes the audience learns that they have little money, living off Helen's immoral earnings - money given her by her lovers, although she is not a true prostitute, being more of a "good time girl". Helen is a regular drinker, and she and Jo have a confrontational and ambiguously interdependent relationship. As they settle in, Helen's surprise at some of Jo's drawings both suggests Jo's talent and originality and shows Helen's lack of interest in and knowledge about her daughter. Jo rejects the idea of going to an art school, blaming Helen for having interrupted her training all too often by moving her constantly from one school to another. Jo now only wants to leave school and earn her own money so that she can get away from Helen. After this conversation, Peter (Helen's younger boyfriend) comes in. Jo assumes that Helen has moved here to escape from him, but the audience is never told the reason why. Peter had not realised how old Helen was until he sees her daughter. Nonetheless he asks Helen to marry him, first half jokingly, then more or less in earnest. In the next scene, Jo is walking home in the company of her black boyfriend. During a light-hearted, semi-serious dialogue, he asks her to marry him, and she agrees, although he is in the navy and will be away on his ship for six months before they can marry. He gives Jo a ring which she hangs round her neck under her clothes to hide it from Helen. Jo tells him that she is really leaving school and is going to start a part-time job in a pub. Back at the flat, Helen informs Jo that she is going to marry Peter. Peter enters, and a dialogue ensues among the three: instead of only Jo and Helen attacking each other, a more complex pattern evolves, with Jo attacking the others, the others attacking Jo, and Helen attacking both Peter and Jo. Jo is truly upset at the thought of Helen marrying Peter, but also pesters and provokes him in an effort to antagonise him even more. After Helen and Peter leave her on her own for Christmas, Jo weeps and is consoled by her boyfriend. She invites him to stay over Christmas, although she has a feeling that she will never see him again. The action moves to the occasion of Helen's wedding, the day after Christmas. Jo has a cold and will not be able to attend at the wedding. Since she is in her pyjamas, Helen catches a glimpse of the ring around her neck and learns the truth. She scolds Jo violently for thinking of marrying so young, one of her occasional bursts of real feeling and concern for her daughter. Asked by Jo about her real father, Helen explains that she had been married to a "Puritan" and that she had to look elsewhere for sexual pleasure. Thus she had her first sexual experience with Jo's father, a "not very bright man," a "bit retarded". She then hurries off to her wedding. Several months later, Jo is living alone in the same shabby flat. She works in a shoe shop by day and in a bar in the evenings to afford the rent. She is pregnant, and her boyfriend has not come back to her. She returns from a funfair to the flat in the company of Geof, an "effeminate" art student, who has possibly been thrown out from his former lodgings because his landlady suspected he was gay. Jo offends him with insensitive questions about his sexuality, and he in turn maliciously criticises her drawings. She apologises and asks him to stay, sleeping on the couch. Geof shows concern for Jo's problems, and they develop a friendly, joking relationship. The audience next sees Jo irritable and depressed by her pregnancy, with Geof patiently consoling her. Then, seeking reassurance himself, he kisses her and asks her to marry him. Jo says that although she likes him she cannot marry him. She makes a sexual pass at him which he fails to recognize, confirming that "it is not marrying love between us". At this point, Helen enters. She has been contacted by Geof, who wishes to keep this fact secret from Jo. Jo, however, guesses as much and is angry with both Helen and Geof. Geof tries to interfere in the quarrel between the two women, but each time he is attacked by one or the other or both. As Helen is offering Jo money, Peter comes in, very drunk, and takes back the money and Helen's offer of a home to Jo. He leaves, insisting that Helen come with him; after a moment's hesitation she runs after him. In the next scene, the baby is due any moment. Jo and Geof seem happy. He reassures her that Helen was probably mistaken about or exaggerating the mental deficiencies of Jo's father. Geof has bought a doll for Jo to practise handling the baby but Jo flings it to the ground because it is the wrong colour: Jo assumes that her baby will be as black as its father. Her momentary outburst against the baby, motherhood and womanhood is short-lived, however, and she and Geof are about to have tea when Helen enters with all her luggage. Apparently, she has been thrown out by Peter and now plans to stay with Jo. To get rid of Geof, she behaves rudely to him, while overwhelming Jo with advice and presents. Jo defends Geof, but while she is asleep, Geof decides to leave, since Helen is too strong for him and he does not want Jo to be pulled between them. Jo wakes, and Helen pretends that Geof is out doing the shopping. When she learns that the baby will be black, she loses her nerve and rushes out for a drink, even though Jo's labour pains have just begun. Alone, Jo happily hums a tune Geof sang before, still not having realised that he is gone. Helen: A hardened, working class single mother and alcoholic. Josephine, her teenage daughter, known as 'Jo', raised solely by Helen. Peter: Helen's younger, wealthy boyfriend from London. The Boy: Also known as Jimmy, a black sailor. Jo falls in love with him and becomes pregnant. Geoffrey: An art student in his early twenties who becomes Jo's roommate and friend. The play was admired by Morrissey of the band The Smiths, who used Delaney's photo on the album cover artwork for Louder Than Bombs. A photograph of Shelagh Delaney appears on the cover for The Smiths' single "Girlfriend in a Coma". An earlier Smiths song, "This Night Has Opened My Eyes", is based on the play and includes a paraphrase of Geoffrey's line to Jo near the end: "The dream has gone but the baby is real." Morrissey's lyrics include other borrowings from Delaney including 'I dreamt about you last night. Fell out of bed twice,' as well as 'river the colour of lead' and 'I'm not happy and I'm not sad', both of which are spoken by the lead character Jo. Other quotations and near-quotations appear in several other songs by The Smiths and Morrissey. The play is referred to by Akira the Don in the title track on the album Thieving (2008), in which it appears to awaken him to literature in a school English lesson. It appears in On Chesil Beach by Ian McEwan, as a film watched by the main characters. ^ This was re-broadcast on BBC Four exactly fifty years later, in September 2010. ^ The Broadway League. "A Taste of Honey | IBDB: The official source for Broadway Information". IBDB. Retrieved 10 April 2012. ^ "A Taste of Honey". The Watford Observer. 2 November 2000. Retrieved 27 December 2018. ^ "Radio 3 – Drama on 3 – A Taste of Honey". BBC. 7 November 2004. Retrieved 10 April 2012. Delaney, Shelagh. A Taste of Honey. Methuen Student Edition with commentary and notes. London: Methuen Publishing, 1982.